On March 7 at 8:30 pm EST (5:30 pm PST/ 6:30 pm MST/ 7:30 pm CST), AASLH will hold a #AASLHchat on Twitter. The topic will be “Museum Advocacy” and is a continuation of our Everyday Museum Advocacy webinar happening the day before (Monday). 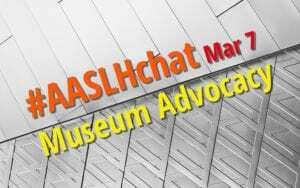 To participate in the open chat, just watch the AASLH Twitter account (@AASLH) and/or the hashtag #AASLHchat at the chat time. Specific prompts will be given at that time. Anyone is welcome to participate in the conversation. You do not have to attend the webinar to participate in the chat. A Twitter chat is a public conversation held at a specific time around a designated hashtag. This open-access platform allows interested people and organizations to discuss a set of prompts given by the chat host.